Xavi joined Barca's academy as an 11-year-old in 1991 and was given his first-team chance under Louis van Gaal. Playmaker Xavi, who has won 22 trophies in 16 glittering seasons with Barcelona, said on Saturday that he would love to take over as head coach one day. The 34-year-old has made more than 700 appearances for the Catalan club, winning three Champions Leagues and seven La Liga titles since making his debut in August 1998. Xavi’s contract at the Nou Camp expires in 2016 and the Spain midfielder wants to move into management once his playing days are over. Asked in an interview with Britain’s Daily Mail newspaper if he would like to coach Barcelona in the future, Xavi replied: “I’d love to, yes … but that is for the future. Right now I love to play football. “When you’re a kid playing, you enjoy having the ball don’t you? All I ever want to do is have the ball at my feet, bossing the game. Xavi joined Barca’s academy as an 11-year-old in 1991 and was given his first-team chance under Dutch coach Louis van Gaal in a side featuring a young Carles Puyol, the player he now shares the club captaincy with. Puyol said earlier this week that he would be leaving the Spanish champions at the end of the season after a persistent battle with a knee injury but Xavi has no intention of following suit. “I’m Barcelona through and through and have always wanted to stay here,” the playmaker said. 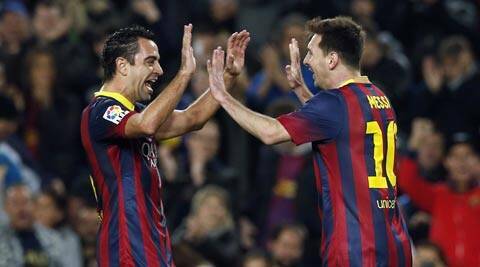 Xavi added that suggestions Barcelona were approaching the end of their era of dominance were wide of the mark. “We have an excellent generation of players,” he added. “Since (former coach Johan) Cruyff changed the history and philosophy of Barcelona, over the last five years that philosophy has gone ‘boom’. “It’s really exploded and we have made history but Barcelona can carry on winning trophies. This is a spectacular crop of players. Barcelona are chasing a treble this season. They are second in La Liga, a point behind Real Madrid with 12 games remaining, and also meet their title rivals in the final of the King’s Cup next month. Barca travel to struggling Real Valladolid in the league later on Saturday and host Manchester City on Wednesday in the second leg of their Champions League last-16 tie, defending a 2-0 lead.